Legally Blonde premiered in pre-Broadway tryouts in San Francisco, California. In April 2007 the show moved to Broadway, opening to mixed reviews and disappointing sales. Jerry Mitchell directed and choreographed. The original cast starred Laura Bell Bundy as Elle, Christian Borle as Emmett and Richard H. Blake as Warner. It received seven Tony nominations and ten Drama Desk nominations but did not win any. The West End production opened in January 2010 at the Savoy Theatre. The West End production was nominated for five Laurence Olivier Awards and won three, including the Best New Musical award. The musical was recorded in September 2007 and aired on MTV in October 2007. Following this, a reality television program was aired showing the audition process for the next person to play Elle Woods on Broadway. The winner was Bailey Hanks, who played the role from July 23, 2008 until the production closed on October 19, 2008. The runner-up, Autumn Hurlbert, was Hanks' understudy. During its San Francisco run, the musical included a song called "Love and War" in place of what is now "Positive". Another predecessor to "Positive" was "Beacon of Positivity". Before going to Broadway, Legally Blonde did a short tryout at San Francisco's Golden Gate Theatre from January 23 to February 25, 2007, with an official opening on February 5. Legally Blonde later opened on Broadway at the Palace Theatre on April 29, 2007, following previews which began on April 3. The production was directed and choreographed by Jerry Mitchell, with set design by David Rockwell, costume design by Gregg Barnes, and lighting design by Kenneth Posner and Paul Miller. The original Broadway cast included Laura Bell Bundy in the lead role of Elle Woods and featured Christian Borle, Orfeh and Michael Rupert. The show received mixed reviews and was nominated for seven Tony Awards, including Best Original Score and Best Leading Actress in a Musical, but did not win any. The musical was filmed for television in front of a live audience on September 18, 2007, as well as two other dates where it was filmed without an audience. The three performances edited together were broadcast on MTV on October 13 and 14, 2007 with subsequent air dates on November 3 and 14, 2007. MTV's involvement with the musical continued with a reality show program called Legally Blonde: The Musical – The Search for Elle Woods, which aimed to cast the next actress to play Elle Woods on Broadway, replacing Laura Bell Bundy. The show was hosted by Haylie Duff, and premiered on June 2, 2008 on MTV. The show ran for eight episodes. The focus was on all the preparation and coaching of the contestants, as well as the auditions themselves. The competition was won by Bailey Hanks, age 20, from Anderson, South Carolina. The results were first aired on July 21, 2008 on MTV, and her debut as Elle Woods was on July 23. The runner-up, Autumn Hurlbert, also debuted on Broadway in this show as a sorority sister in Delta Nu, as well as serving as Hanks's understudy. First National US Tour: The first national tour started on September 21, 2008. Becky Gulsvig, who appeared in the ensemble of the original Broadway cast and understudied the role of Elle Woods, was featured as Elle Woods. Lauren Ashley Zakrin and Rhiannon Hansen, both finalists of the MTV reality show, appeared in the national tour. The original tour closed on August 15, 2010 in Vienna, Virginia at the Wolf Trap National Park for the Performing Arts. Second National US Tour: A non-equity tour launched in Jackson, Mississippi on September 21, 2010. Nikki Bohne led the cast as Elle Woods, with Kahlil Joseph as Professor Callahan The tour closed on May 15, 2011 at the Shubert Theatre in New Haven, Connecticut. The West End production opened at the Savoy Theatre on January 13, 2010, following previews from December 5, 2009. The original London cast included Sheridan Smith in the lead role of Elle Woods, with Duncan James, Alex Gaumond, Jill Halfpenny and Peter Davison. In the London production, the lyrics to “Ireland” were changed. In October 2009, Sheridan Smith, with other cast members, recorded a pop video to the song "So Much Better". The West End cast of Legally Blonde performed a medley from the show at the BBC Television Centre on November 19, 2009 during the Children in Need telethon. Susan McFadden replaced Sheridan Smith as Elle on January 10, 2011. McFadden was later replaced by Carley Stenson on July 11, 2011. Other notable replacements included Richard Fleeshman and Ben Freeman as Warner, Denise Van Outen and Natalie Casey as Paulette, Lee Mead and Stephen Ashfield as Emmett, Carley Stenson as Margot and Siobhan Dillon as Vivienne. The West End show won three Laurence Olivier Awards on March 13, 2011 - 'Best New Musical', 'Best Actress in a Musical' (Sheridan Smith), and 'Best Performance in a Supporting Role in a Musical' (Jill Halfpenny). The first UK tour began on July 8, 2011 at the Liverpool Empire Theatre. The cast included Faye Brooks as Elle, Dave Willetts as Professor Callahan and Iwan Lewis as Emmett. Liz McClarnon initially played Paulette, followed by Claire Sweeney. Following Willets, Professor Callahan was played by Matthew Kelly, and later Les Dennis, alongside Niki Evans as Paulette. Amy Lennox covered as Elle for the Aberdeen run of the tour, with Stephen Ashfield briefly reprising Emmett just weeks after leaving the show in London. On July 17, 2012, Jennifer Ellison replaced Niki Evans as Paulette and Gareth Gates replaced Ray Quinn as Warner. The final show of the UK tour was performed at the New Wimbledon Theatre on October 6, 2012. The Australian production began previews in September 2012 at the Lyric Theatre, Sydney, before opening on October 4, 2012. The production concluded its run at Melbourne's Princess Theatre on July 14, 2013. The show won five Helpmann Awards including Best Musical. Legally Blonde has had international productions in South Korea, China, Malaysia, Japan, The Netherlands, The Philippines, Sweden, Finland, Austria, Dominican Republic, Panama, New Zealand and Germany. In France, a French-language production opened on May 17, 2012 at Le Palace in Paris. The show was a commercial flop and closed on June 10, 2012 after only three weeks because of the lack of spectators. In April & May 2016 a production was presented at the Curve Theatre, Leicester. With X Factor finalist Lucie Jones cast as Elle Woods alongside Ian Kelsey as Callaghan, Tupele Dorgu as Paulette, Jon Robyns as Emmett and Danny Mac as Warner. The cast for the TV airing, filmed in mid-September 2007, consisted of the entire original Broadway cast, except for Tracy Jai Edwards taking over for Leslie Kritzer as Serena and Asmeret Ghebremichael replacing DeQuina Moore as Pilar. Moore departed from the production in July 2007, and Kritzer in August that same year. The musical received mixed reviews but was praised for being a fun and upbeat production. Ben Brantley, reviewing the musical in The New York Times, wrote that the show was a "high-energy, empty-calories, and expensive-looking hymn to the glories of girlishness"; he praised Laura Bell Bundy saying, "she sings and dances flawlessly, and she delivers silly lines as if she meant them." Clive Barnes, in his New York Post review, praised Heather Hach's book but criticized the "amorphous, synthetic, and maniacally empty-headed music", summarizing the show as "a pleasant if noisy night out". Elysa Gardner in the USA Today wrote that the musical was an "ingratiating trifle", and the "game cast ensure that the proceedings, however patronizing, aren't irritating." Jeremy McCarter in New York Magazine lamented that the musical "doesn’t summon memories of Tracy Flick, the steely student-council campaigner that Reese Witherspoon played in Election before starring in Legally Blonde", writing that the "Flickish manic drive" in Witherspoon's Legally Blonde performance had been his favorite part of the film. The show also received some negative criticism. Tim Walker wrote in the Sunday Telegraph: "It is a great big empty vessel of a show that makes a lot of noise and not much else, and would have been better entitled 'Irredeemably Bland'. I was aware that for the whole of the two hours and 25 minutes that it ran, I was sitting among a group of people with vacant smiles on faces that otherwise seemed entirely numbed. That was how I looked, too. It is the expression that registers when what one is seeing doesn't entirely sync with what is going on in one's brain." Quentin Letts wrote for Daily Mail, "It is pink not just in the colour of many of the clothes and stage effects. It is pink to the core of its little, tiny soul ... The plot is pap, the musical unmemorable, the dancing often hefty except for one routine with skipping ropes." The Original Broadway Cast recording was recorded on May 7 and 8, 2007 and released on July 17, 2007 by Ghostlight Records (an imprint of Sh-K-Boom Records). During the week of July 23, 2007, the cast album made its debut on Billboard's Cast Album chart, placing at #1 and charted at #86 on the Billboard 200. During the development phase of the musical, a demo recording was released with twelve songs featuring Kerry Butler and others as Elle. The demo featured workshop versions of "There! Right There!" (labelled on the sampler as "Gay or European"), "Blood in the Water", "Omigod You Guys", "Serious", "What You Want", "Legally Blonde", "Legally Blonde Remix", "So Much Better", "Take It Like a Man", in addition to two songs not present in the finalized version of the show, "Beacon of Positivity" (which became "Love and War" for the previews and eventually "Positive" for the finalized version of the show), and "Good Boy", a song in the place of "Ireland". Bailey Hanks, who won the reality show The Search for Elle Woods, recorded the song "So Much Better", which was released as a single on July 22, 2008. A live London cast recording was recorded featuring Sheridan Smith, Alex Gaumond and Duncan James, on June 12, 13 and 14, 2010. It was released on August 16, 2010. The London Cast Recording used the same track listing as the Broadway Cast Recording, with bonus tracks "Kyle the Magnificent" and the curtain call music added to the digital download version. ^ a b Healy, Patrick (July 29, 2011). "Flops on Broadway? Fix Them Overseas". Retrieved February 25, 2013. ^ Hetrick, Adam (2008-09-24). "Legally Blonde to Close on BroadwayOct.19". Playbill. Archived from the original on April 28, 2009. Retrieved 2009-12-30. ^ Harvey, Dennis (2007-02-07). "Review of "Legally Blonde"". Variety. Retrieved 2009-12-30. ^ "Beacon of Positivity" Archived 2008-01-01 at the Wayback Machine castalbums.org, Retrieved on December 30, 2009. ^ "Good Boy" Archived 2008-01-01 at the Wayback Machine castalbums.org, Retrieved on December 30, 2009. ^ "Season History 2007". shnsf.com. Archived from the original on 15 October 2017. Retrieved 1 May 2018. ^ Pincis-Roth, Zachary (2007-02-24). "Legally Blonde Ends San Francisco Run Feb. 24; Broadway Next". Playbill. Archived from the original on December 11, 2008. Retrieved 2009-12-30. ^ "Nominated Shows". Tony Awards. Archived from the original on April 10, 2008. Retrieved 2010-02-17. ^ Hernandez, Erino (2007-09-26). "MTV Premiere of Legally Blonde — The Musical Moved to October". Playbill. Archived from the original on August 29, 2008. Retrieved 2009-12-30. ^ Hetrick, Adam (2008-05-02). ""Whipped into Shape": Legally Blonde MTV Reality Show to Debut June 2; Duff Hosts". Playbill. Archived from the original on May 5, 2008. Retrieved 2008-05-03. ^ a b Hetrick, Adam (2008-07-21). "Omigod! Bailey is New Star of Broadway's Legally Blonde; Three Finalists Also Land Roles". Playbill. Archived from the original on July 24, 2008. Retrieved 2008-07-22. ^ a b Hetrick, Adam (2008-07-14). "Broadway's Next Elle Woods Will Get a Single of "So Much Better" July 22". Playbill. Archived from the original on July 22, 2008. Retrieved 2008-07-22. ^ "Legally Blonde" Archived 2008-07-04 at the Wayback Machine ibdb.com, Retrieved on February 17, 2010. ^ Jones, Chris (February 27, 2009). "'Legally Blonde' makes its case". Retrieved February 25, 2019. ^ a b Hernandez, Ernio (2008-10-15). "Photo Call: Legally Blonde Musical Tours America". Playbill. Archived from the original on October 18, 2008. Retrieved 2008-10-22. ^ Hetrick, Adam (2008-05-01). "Harvard Variations: Gulsvig Will Lead Legally Blonde National Tour". Playbill. Archived from the original on May 5, 2008. Retrieved 2008-05-02. ^ a b Paddock, Terry (2009-09-10). "Davison & Halfpenny Go Blonde with Final Casting". Whatsonstage. Archived from the original on 2011-06-16. Retrieved 2009-12-30. ^ Hetrick, Adam (2010-05-24). "Legally Blonde's "Ireland" Gets New Lyrics". Playblog. Archived from the original on March 22, 2012. Retrieved 2012-02-18. ^ "Video Gallery". 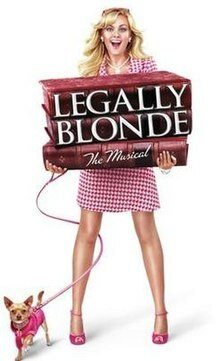 legallyblondethemusical.co.uk. Archived from the original on 9 March 2010. Retrieved 1 May 2018. ^ Spratt, Charlotte (2009-11-21). "Children In Need: Taylor Swift donates $13,000, JLS perform and fans get Doctor Who sneak peek". Daily Mail. Archived from the original on 2012-07-29. Retrieved 2010-02-17. ^ BWW, News Desk (2009-12-16). "West End's LEGALLY BLONDE Institutes First Ever West End Ticket Lottery". BroadwayWorld. Archived from the original on 2011-07-08. Retrieved 2009-12-30. ^ Jury, Louise (2009-12-22). "Legally Blonde proves a box office bombshell". This is London. Archived from the original on December 25, 2009. Retrieved 2010-02-17. ^ BWW, News Desk (2010-07-24). "Siobhan Dillon To Join LEGALLY BLONDE In September". BroadwayWorld. Archived from the original on 2010-07-29. Retrieved 2009-07-24. ^ Ah-young, Chung (2009-09-16). "Legally Blonde' Sparkles With Starry Cast". koreatimes. Archived from the original on 2011-06-23. Retrieved 2009-12-30. ^ Fernandez, Claudia. "Legally Blonde: Feminidad en escena". Listin Diario. Archived from the original on 2014-02-22. ^ Ramos, Jorge. "La Lista de Nominados a Premios Soberano 2014". Periodico Hoy. Archived from the original on 2014-01-28. ^ "La comédie musicale "La Revanche d'une Blonde" s'arrête prématurément à Paris". Ozap (in French). Retrieved December 21, 2018. ^ "Legally Blonde" Archived 2008-07-04 at the Wayback Machine ibdb.com, Retrieved on August 13, 2009. ^ "Cast Announced for Legally Blonde The Musical - Blackpool Grand Theatre". blackpoolgrand.co.uk. 28 April 2017. Archived from the original on 25 January 2018. Retrieved 1 May 2018. ^ Hetrick, Adam (2007-09-10). "MTV Sets Broadcast Date for Legally Blonde". Playbill. Archived from the original on August 14, 2009. Retrieved 2009-08-19. ^ Hetrick, Adam (2007-07-02). "Legally Blonde Welcomes Delta Nu Asmeret Ghebremichael July 2". Playbill. Archived from the original on January 8, 2009. Retrieved 2008-05-09. ^ a b "IBDB Replacements/Transfers". Internet Broadway Database. Archived from the original on 2007-10-17. Retrieved 2008-07-12. ^ Brantley, Ben (2007-04-30). "Candy Worship in the Temple of the Prom Queen". nytimes. Archived from the original on 2009-11-09. Retrieved 2010-01-02. ^ Barnes, Clive (2007-04-30). "WHITHER 'SPOON?". ny post. Retrieved 2010-01-02. ^ Gardner, Elysa (2007-04-05). "No real reason to object to airy 'Legally Blonde'". usatoday. Archived from the original on 2010-12-06. Retrieved 2009-12-30. ^ McCarter, Jeremy (2007-05-03). "Bialystock and Gloom". nymag. Archived from the original on 2008-12-11. Retrieved 2009-12-30. ^ a b Bosanquet, Theo; Warden, Kelly Ann (2009-01-14). "What's the Verdict on Legally?". Whatsonstage. Archived from the original on 2010-01-17. Retrieved 2010-02-06. ^ Taylor, Paul (2010-01-14). "First Night: Legally Blonde, Savoy Theatre, London". The Independent. London. Archived from the original on 2017-01-10. Retrieved 2017-01-10. ^ Hernandez, Erino (2007-07-26). "Blonde Beats Green: Legally Blonde Tops Wicked for Debut on Billboard Chart". Playbill. Archived from the original on 2012-09-06. Retrieved 2009-12-30. ^ "Legally Blonde Promo Recording" Archived 2007-12-17 at the Wayback Machine castalbums.org, Retrieved on December 30, 2009. ^ "Legally Blonde Demo Recording" Archived 2008-05-24 at the Wayback Machine castalbums.org, Retrieved on December 30, 2009. ^ Hetrick, Adam (2008-04-30). "Legally Blonde and Tartaglia Among Daytime Emmy Nominees". Playbill. Archived from the original on May 1, 2008. Retrieved 2008-05-01. ^ Bacalzo, Dan (2009-04-14). "Stacy Keach, Alice Ripley, Chita Rivera, Aaron Tveit, and More Receive Helen Hayes Awards". theatremania. Archived from the original on 2009-07-27. Retrieved 2009-12-30.